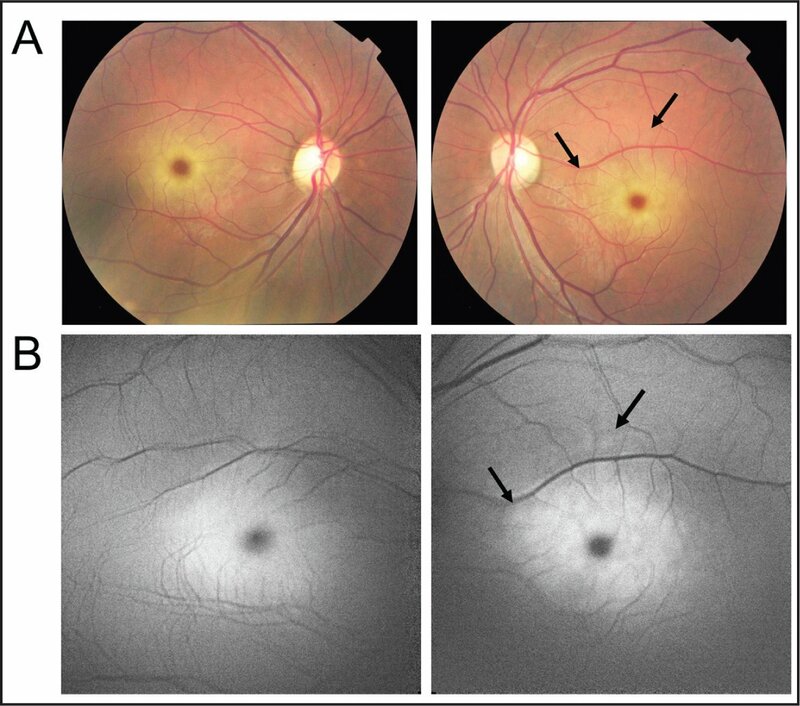 The authors report the characteristics of fundus autofluorescence (FAF) images in a patient with galactosialidosis who presented with a macular cherry-red spot ophthalmoscopically. The cherry-red spot in the macula was hyperreflective in the FAF images. 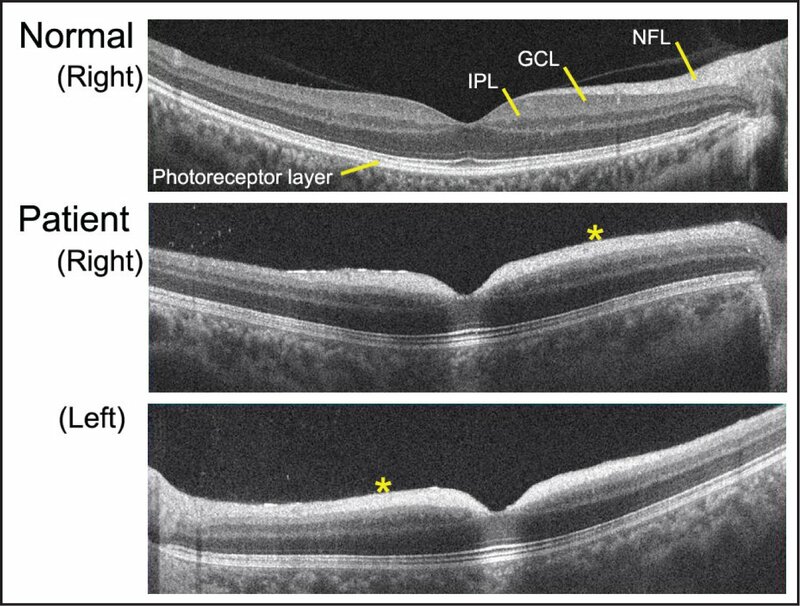 Optical coherence tomography (OCT) revealed an abnormally hyperreflective region in the retinal ganglion cell layer; however, the boundary between hyperreflective and normal regions was not clear. The findings indicate that FAF may be a more useful method to detect macular lesions than conventional funduscopic examination and OCT imaging in patients with lysosomal storage diseases presenting with a macular cherry-red spot. From the Department of Ophthalmology, National Tokyo Medical Center, Japan (RS, TN); Laboratory of Visual Physiology, National Institute of Sensory Organs, Tokyo, Japan (K Tsunoda, KF); and the Department of Ophthalmology, Keio University School of Medicine, Tokyo, Japan (RY, KF, K Tsubota). Supported by the Ministry of Health, Labor and Welfare, Japan; Grant-in-Aid for Scientific Research; and Japan Society for the Promotion of Science. Address correspondence to Kazushige Tsunoda, MD, PhD, Laboratory of Visual Physiology, National Institute of Sensory Organs, 2-5-1 Higashigaoka, Meguroku, Tokyo 1528902, Japan; +81-3-3411-0111; fax: +81-3-3411-0185; email: tsunodakazushige@kankakuki.go.jp. We present the fundus autofluorescence (FAF) findings in a patient with genetically confirmed galactosialidosis. No similar images have been published. The patient’s best corrected visual acuity was 0.3 for both eyes, and Goldmann perimetry revealed a relative central scotoma bilaterally. Slit lamp examination showed no clouding of the cornea, and funduscopic examination revealed a macular cherry-red spot bilaterally (Figure 1A, page 260). Optical coherence tomography (OCT) with the Cirrus HD-OCT, version 5.1 (Carl Zeiss Meditec, Jena, Germany), showed an abnormal hyperreflectivity in the retinal ganglion cell (RGC) layer, which made it difficult to differentiate the RGC layer from the nerve fiver layer (Figure 2, asterisks; page 260). The thickness of both the RGC and nerve fiber layers were normal, and the appearances of outer retinal structures were also within normal limits. Fundus photographs and fundus autofluorescence (FAF) images. (A) Fundus photographs showing cherry-red spot in both maculas. (B) FAF images showing abnormal hyper-autofluorescence in the macula. The lesion seen in the FAF has expanded over that seen in the fundus photograph (arrows). Optical coherence tomography (OCT) of a normal subject and a patient with galactosialidosis. The retinal ganglion cell layer (GCL) appears hyperreflective in the macula, and the boundary between the nerve fiber layer (NFL) and the GCL is unclear (asterisk). IPL = inner plexiform layer. FAF images were recorded with 488-nm wavelength using a barrier filter for the detection of emitted light above 500 nm (HRA2; Heidelberg Engineering, Heidelberg, Germany). A clearly demarcated hyperreflective region was detected in the macula, which spared the fovea in both eyes (Figure 1B). The region of FAF abnormality overlaid not only the cherry-red spot but also areas appearing normal ophthalmoscopically (Figure 1, arrows). Our results demonstrated that FAF can detect a hyper-autofluorescent lesion more clearly than conventional ophthalmoscopic examination. In the OCT image, an abnormally hyperreflective region could be detected in the RGC layer; however, the boundary between hyperreflective and normal regions was not clear.3 We have searched PubMed with the terms “cherry red spot” and “autofluorescence” and confirmed that no published study has described similar features. A cherry-red spot may not be apparent at the early stage and in less symptomatic types of various storage diseases.4,8 The cherry-red spot is also known to disappear at the late stages of some diseases.4 In such cases, FAF may be potentially more sensitive for the detection of macular lesions. Our results indicate that FAF may be a useful method to detect macular lesions in patients with galactosialidosis and other lysosomal storage diseases. Zhou XY, Galjart NJ, Willemsen R, Gillemans N, Galjaard H, d’Azzo A. A mutation in a mild form of galactosialidosis impairs dimerization of the protective protein and renders it unstable. EMBO J. 1991;10(13):4041–4048. Allegranza A, Tredici G, Marmiroli P, di Donato S, Franceschetti S, Mariani C. Sialidosis type I: pathological study in an adult. Clin Neuropathol. 1989;8(6):266–271.